Cattails grow around many ponds and lakes. They can be aesthetically unappealing and inhibit the use of your swimming area. Cattails are very identifiable because of to their fruit’s unique, corndog-like shape. The fruit is called a catkin and grows at the top of the plant. The catkin becomes fuzzy in the fall when it spreads its seeds. These plants can be ugly and messy so removal is often desired. You might have tried removing them by pulling them out by hand or cutting them down. Pulling the cattails out by hand can be a waste of time and energy since the cattails will grow back if the whole root system is not removed. Cutting down the plant below water level to drown it can stimulate growth if done too early in the season. Chemical control with an aquatic herbicide is the easiest and most effective way to deal with cattails. We recommend using our cattail and water lily control products for emergent weed control. The product has two parts. Alligare Glyphosate is an herbicide that kills emergent weeds (weeds that grow up above the water from below the surface) like cattails. It is combined with the Alligare Surfactant, which helps the herbicide adhere to the cattails by breaking down the outer layer of the leaves. This allows the herbicide to be fully absorbed into the plant. Once the cattails have dried up and are crispy, you can go ahead and cut them down. You’ll want to wait until they are completely dried up and dead after 3-4 weeks so that when you pull them, the seeds will not spread. Our products are great for treating other emergent vegetation around your pond or lake, like bulrush, phragmites and purple loosestrife. Treatment should be done when the weeds are at least 4 ft tall, generally in the spring or fall. These products are EPA approved and have no swimming or fishing restrictions. You can have a clear pond or lake shore; see results in as little as one week! Visit us at LakeRestoration.com for all your aquatic herbicide needs. What Kind of Algae do you Have? Pond algae can come in many forms, and each pond ecosystem can produce a variety of different species of algae. Algae can form from a variety of factors, including excess nutrients, hot weather, stagnant water and gas build up, just to name a few. Once you identify your algae, the easier it is to treat. But how do you know what kind you have? Below are several forms of algae that are common in ponds. Find which algae you have and the best way to keep it under control this summer! Chara is a form of algae that often gets mistaken for a weed. It forms a stem and leaf-like structures, but it will be free-floating in the water without roots. Chara has foul smell and a grainy texture. If you crush it between your fingers, it smells like garlic. When left in the sun and out of the water, it will turn to and ashy-grey color. Chara can be difficult to control. We recommend using a combination of Mizzen® algaecide with Copper Sulfate at higher label rates to kill this plant. If the plant becomes calcified, it may become harder to treat. Filamentous algae is often referred to as pond scum. It can form in mats on top of the water and look like thick, green slime. This algae can form on rocks and other things underneath the water as well. If filamentous algae covers the entire surface of the pond, it can block out the sunlight and deplete the oxygen in the water for fish. Filamentous algae can be treated by using Mizzen® Algaecide every 4-6 weeks, or as needed when algae returns. Planktonic algae can will look like your water is changing color. It can be present throughout the whole water column. This green or blue-green algae can make your pond look like pea soup or paint. Planktonic algae will stick to things, like rocks, docks, or shorelines. Planktonic algae can be treated with Mizzen® Algaecide. Now that you know what kind of algae you have, it will make it easier to figure out a plan for treatment. Mizzen® Algaecide and Copper Sulfate will be the go-to products for treating any of these types of algae. We also recommend applying nutrient reducers, like SparKlear®, to help reduce the excess nutrients in your pond and help with water clarity. These can be applied once a month. Visit our website at LakeRestoration.com to find all of our weed and algae solutions. Also, checkout our Aquatic Plant Identifier tool to help you find what kind of weed you have in your pond! As the temperatures rise around the country this time of year, you may find that your pond is looking more green than usual. This is because warm temperatures, along with organic matter and excess nutrients in the water can create the perfect environment for very rapid algae growth. To keep a clear pond, you need to be proactive taking the right steps to keep algae away. Keeping your pond clear of algae is similar to weeding your garden; you need to keep up with it, or it will get out of control. Starting early can really make a difference in your success. Take note of some helpful tips and product recommendations to keep up with your pond. Using an algaecide, like our copper-based Mizzen® algaecide, will be a key factor in eliminating algae once it has grown underneath or on top of your pond. Mizzen® is sprayed over the algae or can be applied with the TORMADA® remote controlled application boat. Mizzen® can help clear up your pond in as little as 7-14 days, with full results seen in a month. Algae can re-grow rapidly, even within a few days, so make sure you have enough Mizzen® on hand for a second treatment or spot treating. A half gallon of Mizzen will cover 20,000 square feet, and is $25.00. Nutrient reducers, such as SparKlear® and PhosControl® can help reduce the organic matter in your pond. SparKlear® contains bacteria and enzymes that eat away at the nutrients in your pond, and it can help improve your pond’s water clarity. PhosControl® contains aluminum sulfate that binds with phosphorus. Monthly treatments with these products are recommended. Aerators or aerating fountains work to keep water moving and will help exchange gases trapped in the water that are aiding in pond algae growth. Lake Restoration offers Vitaflume® floating and aerating fountains in 3 different sizes and can move 7,000-10,000 gallons of water per hour. Floating fountains keep water moving so that algae mats cannot form like they would in more stagnant waters. Aerating fountains help your pond “breathe,” exchange gasses that help weed growth, and they also look great as a centerpiece. Vitaflume® starts at $875 and offers optional LED lighting so you can customize the look of your centerpiece. Dibrox® herbicide: controls floating and submerged weeds like Eurasian Watermilfoil and duckweed. Mizzen® algaecide: to control filamentous and planktonic algae and scum. SparKlear® or PhosControl® nutrient reducers: Improve water clarity and reduce nutrients. Sapphire Bay® Pond Dye: Do give your pond a pleasing blue color. Following these steps will help improve your pond’s health starting early in the spring. Visit LakeRestoration.com, or call a Lake Expert to learn more about these products. If you have a pond or small lake, chances are you’ve had to deal with some kind of weed or algae problems from year to year. It might be difficult to figure out which aquatic herbicide is best for you, your weeds, and your pond’s needs. At Lake Restoration, we have two great options for treating ponds and small lakes for weeds (you can check out all of our pond products on our website). Spritflo® herbicide and Dibrox® herbicide will be your best options for fighting submerged and floating weeds in your pond all year long. How do you decide which one is best for you? Here is more information on both our products to help you make the best decision for your pond. Spritflo® is a suspended aquatic herbicide that is fluridone-based. This herbicide is best for duckweed and other submerged weeds, like hydrilla, coontail, and more. Spritflo® will work in your water for 30-45 days. We usually recommend two treatments per season when the weeds are present and actively growing at or near the surface. Spritflo® can be mixed with water and sprayed on the pond. It can also just be poured in the water around the pond, and it will spread through the water by itself within 24 hours. Spritflo® is not a contact herbicide, so it cannot be used to spot treat an area of a larger body of water. You will need to treat all of your water with this product. Recap: Spritflo® is great for those wanting to treat their whole body of water. It is easy to apply, since you can simply pour it in the water and it will spread by itself. It stays suspended in the water for up to 45 days for longer control. Dibrox® herbicide is also a great herbicide for submerged and floating weeds, like duckweed, coontail, hydrilla and mifoil. It controls duckweed in 5-7 days, and submerged weeds in 17-21 days for quick control. We usually recommend using this every 4-6 weeks, or when you see the weeds present and actively growing at or near the surface. Dibrox® is a contact herbicide, which means it works directly where it is applied. You can mix Dibrox® with water and spray it over the weeds where you want to treat. This product also works great in our remote control product application boat, the TORMADA®! Dibrox® will sink down under the water to control submerged weeds. You can treat your whole body of water, or you can spot treat smaller sections of weeds. Recap: Dibrox® is great for anyone looking for quicker control of weeds. It also great for people who don’t want to treat their whole body of water, but only parts of the water or sections of weeds. Finding a pond herbicide can be difficult. Knowing the kind of control you want can help you narrow down a product that will work great for you. Now that you know a little more about our herbicides, you can be one step closer to controlling your pond weeds all season long. Visit our website at LakeRestoration.com for more information on products for your pond or small lake. Pond Maintenance Plan: Start Now for Spring and Summer Success! Spring is here! For certain parts of the country, warmer temps are already starting, which means so has aquatic weed and algae growth. Get a jump start on your aquatic weeds, and plan your treatment schedule for spring and summer! This will make treating your pond easy and routine. Don’t let the algae and weeds ruin your summer fun! First, you’ll need to know what you’ll be treating in order to find the right product for your vegetation. If you have had a pond for a while, you might already know what kinds of issues arise year after year. If you are new to owning a pond, or you need to identify a specific weed type, here’s how. B. If you have done this and you want to identify it further, you can pull some weeds or algae out of your pond and examine it on a white paper towel to identify a species. Use our aquatic plant identifier tool to help you identify the species. C. You can always send Lake Restoration photos of your pond and plants for our Lake Experts to take a look at and identify for you. Send your photos to lrmail@lakerestoration.com. Depending on your aquatic vegetation, you might need different products to treat different vegetation. You may have algae, submerged weed, floating weeds, or all three! We have products that treat them all. Floating weeds float on the surface of the water. Common floating weeds include duckweed and watermeal. For Duckweed: Dibrox® aquatic herbicide or Spritflo® aquatic herbicide can be great for treating duckweed and other floating weeds in your pond. Watermeal: Clipper herbicide is great for killing watermeal floating on the surface of your pond. Submerged weeds are rooted in the ground underneath the water and grow up towards the surface. 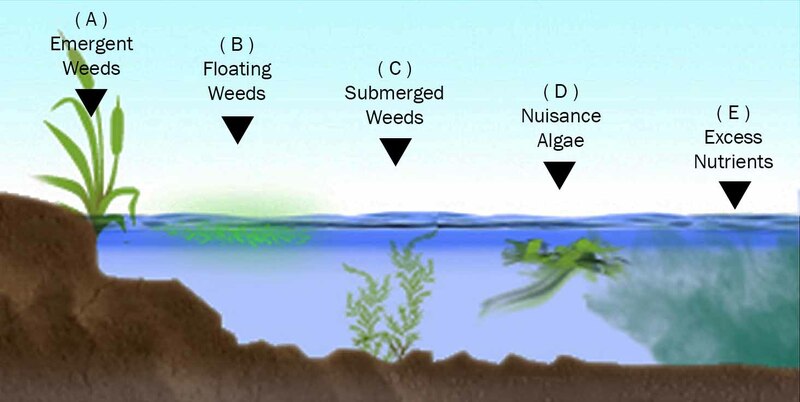 Common submerged weeds include milfoil, hydrilla, coontain, pondweeds, and more. Just like with floating weeds, submerged weeds can be easily controlled using Dibrox® or Spritflo® herbicides. These herbicides are great for pond use. We also carry a variety of other herbicides, liquid and granular, that will control submerged weeds as well. Emergent plants are plants that grow above water or on your shoreline. These include cattails, water lilies, grass, weeds, poison ivy, and woody brush in and around ponds and lakes. SOLUTIONS: To control emergent plants, use Glyphosate 5.4 to control problem areas. It is also recommended to use a surfactant to help Glyphosate spread. This treatment kills plants at the roots, and there are no restrictions for swimming and fishing. Algae can look like scum on the top of your pond, and it can form below the surface as well. Common algae includes planktonic, filamentous, and submerged algae. Algae can grow quickly in warm water, and spread within a few days. Mizzen® Algaecide is a liquid, copper based algaecide that is great for treating your pond for all kinds of algae. Trout, Catfish, and Koi fish are allergic to copper. If you have these types of fish in your pond, we recommend using GreenClean algaecide. Most of our herbicides call for twice a season applications (could be more often if you are spot treating with certain products). Our Mizzen® algaecide should be used every month, or when algae is reappearing. If you have weeds and algae, we recommend you check out our Pond Products page. There you will find your herbicide, algaecide, nutrient reducers and pond dyes to help give your pond the beautiful look it was intended to have. These products go great with our TORMADA® Remote Application Boat. Refer to our Pond Maintenance guide for quick reference throughout the year. Lake Restoration is here to help you make pond weeds and algae one less headache. With a good plan in place for the season, you are sure to be successful in maintaining a healthy pond! Using Nutrient Reducers to help slow down algae growth. If you are like most people with a pond, you may be in a constant battle with algae and pond weed growth during the warmer months of the year. This is because aquatic plants thrive in warm weather and the conditions that it brings to your pond. Lack of water movement can create a buildup of gases in the water caused by decaying leaves and algae that don’t have a chance to be exchanged back into the air. Runoff from lawn fertilizer or farm fields could also cause an abundance of nutrients in the water that only fuels algae and weed growth. So what are some things you can do to control and reduce the amount of built up organic matter and excess nutrients in your pond? Lake Restoration offers two nutrient reducers specific for ponds, SparKlear® and PhosControl®. SparKlear® contains bacteria and enzymes that work in your pond to break up organic matter (such as muck, grass, algae, and dead and decaying weeds and leaves). While reducing the amount of organic matter in your pond that algae feeds from, it also improves water clarity in you pond. A pint of SparKlear® starts at $23.70, and more sizes are available depending on the size of your pond. We recommend treating once a month with this product. Try applying it with the TORMADA® remote control application boat! PhosControl® works by using aluminum sulfate to bind with phosphorus in your water. Phosphorus is another nutrient aquatic weeds and algae like (phosphorus can be from farm field or lawn fertilizer runoff). Without excess phosphorus in your water, weed and algae reproduction will slow down. Just one pound of phosphorus can produce 500 pounds of aquatic plant and algae growth, so making sure phosphorus isn’t in your water could be the key to successful aquatic weed and algae management. 1 pound of PhosControl® is $19.99 and will cover 2,000 square feet. Larger sizes are available. You can reduce the amount of organic matter buildup in your pond by keeping things like weeds and grass clippings out of your pond. These grass clippings and weeds create food for algae. Shop these products at LakeRestoration.com. To keep a clear pond, especially at this point in the season, you need to be proactive about making sure you are taking the right steps to keep algae away. Keeping your pond clear of algae is similar to weeding your garden; you need to keep up with it, or it will get out of control. We recommend treating every 3-4 weeks to keep your pond looking great! Using an algaecide, like our copper-based Mizzen® algaecide, will be a key factor in eliminating algae once it is grown underneath or on top of your pond. Mizzen® is sprayed over the algae or can be applied with the TORMADA® remote controlled application boat. Mizzen® can help clear up your pond in as little as 7-14 days, with full results seen in a month. Algae can re-grow rapidly, even within a few days, so make sure you have enough Mizzen® on hand for a second treatment or spot treating throughout the season. One gallon of Mizzen will cover 20,000 square feet, and is $34.95. Mizzen® is also available in smaller sizes or gallon packs. Nutrient reducers, such as SparKlear® and PhosControl® can reduce the organic matter in your pond that weeds and algae feed off of. When used in conjunction with an algaecide, you will be reducing existing algae and making it harder for it to regrow. SparKlear® contains bacteria and enzymes that eat away at the nutrients in your pond, and it can help improve your pond’s water clarity. PhosControl® contains aluminum sulfate that binds with phosphorus (which algae feed off of) making the phosphorus unavailable for the algae. Monthly treatments with these products is recommended. Aerators or aerating fountains work to keep water moving and will help exchange gases trapped in the water that are aiding in algae growth. Lake Restoration offers Vitaflume® floating aerating fountains in 3 different sizes and can move 7,000-10,000 gallons of water per hour. Fountains keep water moving so that algae mats cannot form like they would in more stagnant waters. Aerating fountains help your pond “breathe,” and they also look great as a centerpiece. Vitaflume® starts at $975 and offers optional spray patterns and lighting so you can customize the look of your centerpiece. Mizzen® algaecide: to control filamentous and planktonic algae in scum. SparKlear® or PhosControl® nutrient reducers: to reduce algae fuel and sludge, and improve water clarity. *for lakes and dock and swim areas, use Mizzen®, Dibrox® and MuckMaid® pellets. Following these steps will help improve your pond’s health over the hottest months of the summer when algae growth is rapid. Visit LakeRestoration.com, or call an Aquatic Expert to learn more about these products. Have you ever looked at your pond or water feature and noticed that it looks a little… lifeless? You may even notice a foul smell coming from your pond. You are treating for weeds and algae, but you’re wondering if there is something else you can use to keep your pond healthy. Poor pond health can be caused by decaying leaves, excess nutrients, and lack of movement in the water. Having little movement in your pond can be an issue if you have fish because of the lack of oxygen in still waters. A pond with no movement can become a less-than-ideal environment for fish and a perfect environment for weed and algae growth. A fountain, like the Vitaflume® Floating Fountain from Lake Restoration, is a great way to keep the water moving in your pond or water feature. It can help improve the health of your pond in many ways. They also look beautiful! Here are some ways your pond could benefit from a fountain. When you exchange water from in the pond to the air, you are increasing oxygen content in the water and reducing gas buildup. This can improve the smell of your pond. Oxygen will be absorbed by the water exposed to the air, and the gasses that have been trapped in the water will be released. This is letting your pond “breathe” and is a great benefit for the life of your pond. As the weather and water warms up, there is less oxygen in the pond than there is during colder weather. Making sure there is enough oxygen in the pond during the warm weather months will ensure your fish won’t suffocate. Keeping movement in your pond will prevent surface scum from forming. Movement from the fountain will continuously break up algae on the surface, preventing growth. Also, ponds with low oxygen may have excessive carbon dioxide levels, which provides perfect growing conditions for algae. Keeping water flow and movement will reduce nutrient levels, making it harder for algae to grow. Fountains are a great way to add interest and beauty to your pond or water feature. If you are looking to add something more to your pond landscapes, a fountain is the perfect cherry on top for any waters. The Vitaflume® Fountain from Lake Restoration has a pump housing and filter that is made of high-quality stainless steel for durability, ensuring your fountain will last for years to come. Vitaflume® features an impeller for high volume, and is direct from the manufacturer, Lake Restoration, saving you money. Fountains can add beauty and help improve the health of your pond. Vitaflume fountains impel 5,000 more gallons per hour than other leading brands. With optional lighting and spray patterns to choose from, you can customize the perfect fountain for your water.